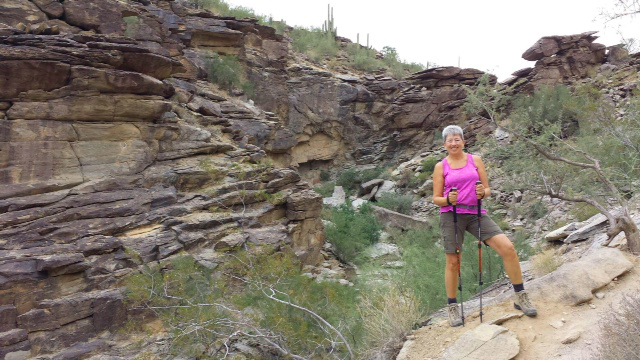 If you love to be outdoors away from the hustle and bustle surrounded by fun friendly people on a trail with saguaro cactus and spectacular views of the desert then you are going to love hiking with the Sun Lakes Hiking Club in Sun Lakes Arizona! Sun Lakes is a Robson developed active adult community just south of Chandler in the East Valley of the Phoenix area. Ranked as one of the top communities in the United States this area features almost 10,000 homes in five separate developments – each with their own amenities such as golf, tennis, fitness and swimming pools. With 99 holes of golf, 27 tennis courts, 12 swimming pools, multiple restaurants and so many amenities you couldn’t possibly become bored. One of the top reasons our clients love it is the location! Less than a half hour from Sky Harbor and Mesa Gateway Airports, minutes from the I-10, the 101, the 202 and major shopping malls and restaurants make this location perfect to almost anywhere! Choose from “lock and go” villas which are two units with one common wall. Size ranges from 1400 to 1775 square feet. The separate homeowner association fee takes care of all exterior maintenance such as roof, paint and landscaping. Or choose a single family home either on the golf course or walking path or one with a privacy block fence. Homes range from 1400 to 3600 square feet. There is something for everyone in Sun Lakes Arizona. Homeowner fees are affordable and range from $1200 to $1600 annually and cover all common areas plus street maintenance in the gated communities. You can search for all active listings for sale on our website. Sun Lakes not only has world class amenities such as tennis, golf, swimming and fitness centers, it is also chock full of clubs and social organizations. The hiking club is one of those. Sun Lakes Hiking Club currently has many active members who participate in the scheduled Monday and Wednesday hikes from November through April. All hikes meetup at Cottonwood Country Club parking lot. 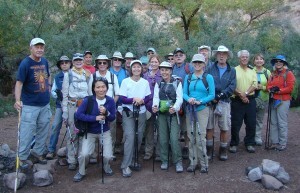 From the beginning of November through the end of February, hikers meet at 7:45 a.m. and leave at 8:00 a.m. 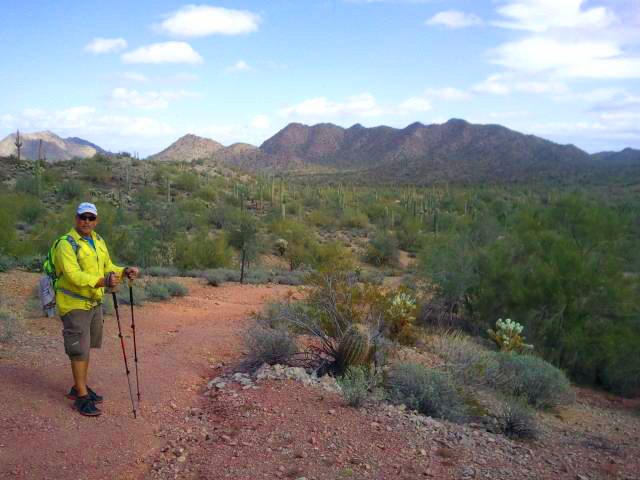 In March and April, hikers assemble at 6:45 a.m. and leave at 7:00 a.m. May to November hikers can meetup on Monday mornings at 6:15 a.m., choose a destination, and depart for the hike at 6:30 a.m. Members carpool to the hikes and share expenses based on driving distance to the trail head. I have always enjoyed being outdoors and love the smells, sounds and sights when out on a hiking trail. The skies are brilliant blue, the mind has a chance to wind down and relax and it is great exercise. Couple that with the camaraderie of friends both old and new and it is a perfect day! One of our clients shared a couple of photos from a recent hike they were on. They also like to bike – as in Harley Bikes but that’s a topic for another blog. If you are interested in the active adult Sun Lakes Arizona community or want to know more about the real estate market and trends contact me and we will be happy to answer your questions, set up a private portal search or just tell you more about the fantastic community we live in. We live here, we work here and we play here – can’t beat the lifestyle! Filed Under: Chandler AZ Real Estate Tagged With: "Hiking", "My Sun Lakes Homes", "Sun Lakes Blog", Cottonwood, Ironwood, Oakwood, Palo Verde, real estate listings, sun lakes arizona, Sun Lakes Arizona Hiking Club"